The contest is over. And the winner, chosen randomly, is Anita E! Congratulations! 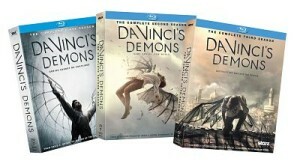 Please email your mailing address to lhlerman@gmail.com before February 3 to claim your prize. 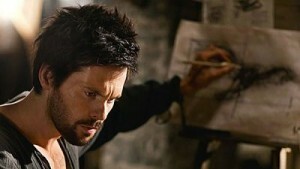 The third season of Da Vinci’s Demons, Starz’s adventure-fantasy series about Renaissance Man Leonardo da Vinci and his time-tripping escapades as he cavorts in-and-out of his own reality and time, arrives on disc on January 26. 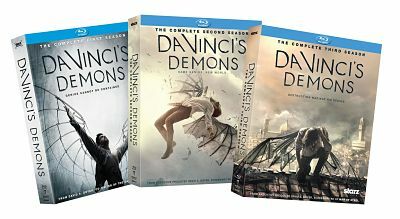 To celebrate its arrival, Anchor Bay is providing Disc Dish with one Da Vinci’s Demons Blu-ray Prize Pack consisting of all three season of the smash show to give away to a lucky reader! If you don’t already, Like Disc Dish on Facebook, Follow Disc Dish on Twitter or subscribe to Disc Dish by email (see the box on the right), then leave a comment on this page saying whether you’re a Facebook or Twitter fan or email subscriber. That gives you one entry. If you only do this step, you’re entered, but keep reading for more chances to win. This giveaway runs through midnight, Tuesday, January 26, and the winners will be chosen at random and announced here on January 27. So, make sure you check back to see if you won! NOTE: The contest is only open to readers who are 18 or older and in the U.S. Prizes cannot be shipped to P.O. boxes! I’m a a Facebook, Twitter fan and email subscriber. I also am a Disc Dish email subscriber. I’m an email subscriber, twitter follower & facebook fan. I am a facebook and twitter fan. I am a Disc Dish email subscriber. I’m also a Disc Dish email subscriber. I’m an email subscriber, twitter follower and facebook fan. I’m an email subscriber, twitter follower, and facebook fan. I subscribe via email, and follow on Twitter. I follow on Twitter and subscribe via email. I am an email subscriber, twitter follower & facebook fan.